The participants of Orioles Dream Week were treated to quite a surprise Wednesday morning as Hall of Fame manager Earl Weaver walked in to the morning camp meeting. For many, it was a highlight of the week. As Weaver hung around to watch some of the Dream Week action, a few campers took the chance to pick Weaver’s brain. Kevin Jones of Baltimore asked the former skipper to come out and kick some dirt on an umpire. After posing for pictures with the umpires, one of them playfully tossed Weaver before he had a chance to follow through on Jones’ request. “Earl was giving us tips and telling stories while cracking on guys at the same time,” said Todd Donnelly of Allentown, Pennsylvania. After visiting with all of the participants at a reception on Wednesday night, Weaver signed baseballs and photos for all, providing each with a treasured souvenir. For Ginsberg, just meeting Weaver was more than enough. 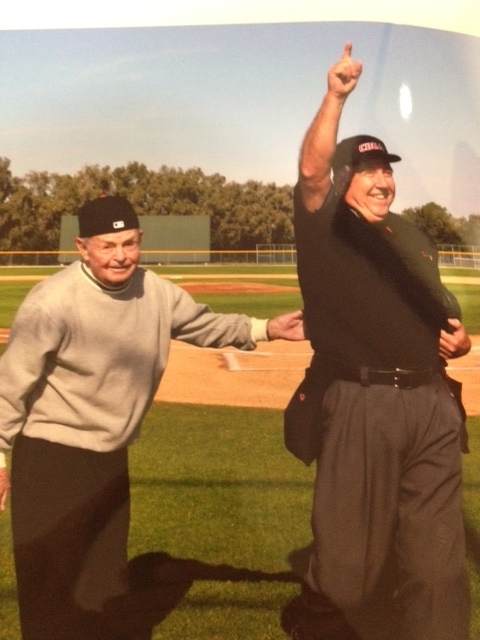 Earl Weaver was one of the all time great coaches. I have been an Oriole fan since I was 9 or 10 yrs old and I’m 54 now so thats been several yrs now lol. Weaver coached some of the best to ever don a uniform..Brooks…Frank.. and all the rest. That would simply be a dream come true to be able to sit in a dugout and listen to one of the most colorful men of his time. Great article !! !